You bet there are low sodium recipes for sausage! As a home sausage maker you have complete control over the ingredients you put into your product. One of the biggest reasons salt has always been associated with sausage making is because of the preservative value it brought to the mix. That isn't nearly as important anymore. Now we store our sausage by freezing it, and the salt in most recipes is there simply as a flavor enhancer (or out of habit). If we replace salt with other spices and herbs, we can make a much more healthy and heart-friendly product and still have great tasting sausage. ...cures are sodium based (sodium nitrate and sodium nitrite). If we want truly low sodium sausage, we can't make a smoked or cured product. 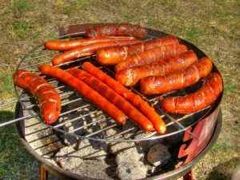 We can, however, still have smoky flavored sausage by using liquid smoke. ...My friend has hundreds (really!) of great low/no salt ideas on her site. I recommend you Click Here for her Great No Salt Recipes.